Government forces reportedly set out after dark Monday night to destroy Jewish homes in five budding communities in Judea and Samaria. Government forces set out after dark Monday night to destroy five budding Jewish communities in Judea and Samaria. Residents of the central Samaria outpost of Ramat Gilad received a message late in the evening that Israel Police officers and IDF soldiers were "on the way" to their location first. The residents told Arutz Sheva they believed "the army will attempt to throw us out of our homes and demolish them." 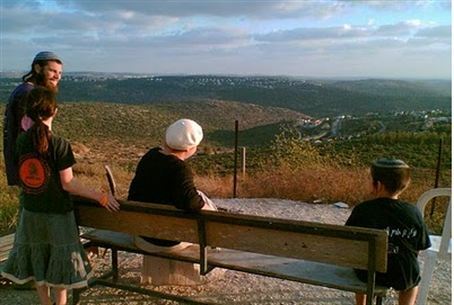 Residents of nearby Karnei Shomron and other towns in the area were alerted to the situation and reportedly began to make their way towards the site. Michal Shoham of Ramat Gilad called on the public earlier in the day to come to the western Samarian Jewish outpost community to help its residents, amid the growing reports that the police and the military had planned to carry out evictions and demolitions at the site. Interviewed on Arutz Sheva's Hebrew program, Shoham said there was no truth to reports that an agreement had been signed, under which two caravan mobile homes would be relocated and eight buildings would be permitted to stand. Shoham, whose father, Moshe Zar owns the land, said there had been dialogue aimed at avoiding the demolitions -- but no agreement had been reached. Ramat Gilad is one of two outposts named for her brother, Gilad Zar, a security officer who was killed by terrorists. Four other outposts are reportedly also slated for demolition overnight, according to the report. Although no specific details were available, sources said the targets were likely located in the area of the Judean city of Hevron as well as in the Samaria region. The destructions are allegedly scheduled to take place at approximately 3:00 a.m. or shortly thereafter, and roads leading to the areas will be sealed off prior to the demolitions in order to prevent other residents in the area from interfering with the process.